In every corner of the world, monuments and memorials are created to commemorate pieces of the past that need to be remembered. 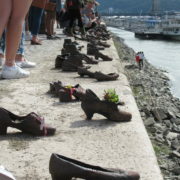 During our travels throughout Europe, I began to pay closer attention to the effectiveness of each of these memorials. Before this trip, I tended to take memorials for what they were without considering them in a broader context. Discussing the effectiveness of these memorials with my peers forced me to pay closer attention to how they made me feel, how well they expressed their message, and how they could be improved. 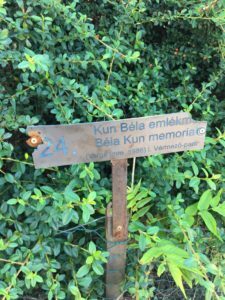 I first experienced this during our visits to two museums in Hungary, Memento Park and the House of Terror. Both museums were created to memorialize the same era in history, but my reactions to these visits were drastically different. 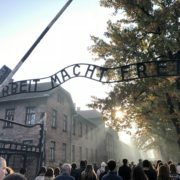 The contrast of my experiences at these two museums opened my eyes to the importance of considering the different ways these memorials tell their story. 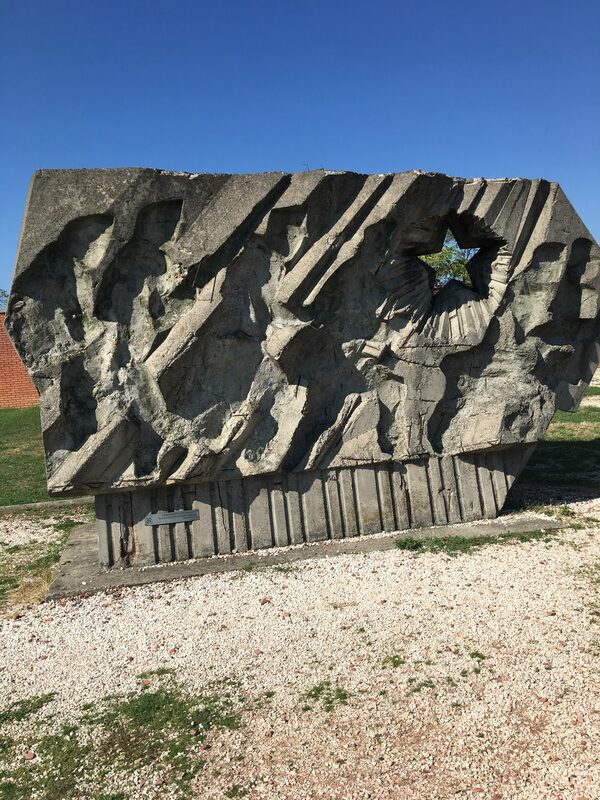 Memento Park is a collection of 42 statues and plaques from the Communist era in Hungary between 1945 and 1989, including statues of some of the best-known communist leaders such as Lenin, Marx, and Engels. 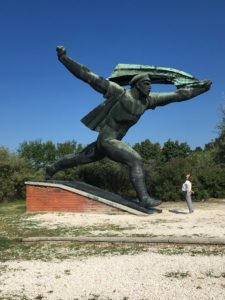 After the fall of Communism in Hungary, these statues were immediately removed from the city center and stored away until the opening of the park in 1993 on the second anniversary of the last Soviet soldier leaving Hungary. Being from America where much of our darker history tends to be pushed under the rug and people come in droves to demand the removal of offensive monuments of the past, I was instantly curious why the people of Budapest chose to keep an entire museum of statues commemorating leaders that historically suppressed so many Hungarian citizens. 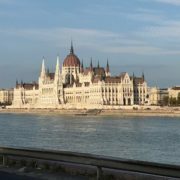 The explanation of this decision can be put simply in a quote by the park’s architect, Ákos Eleőd: “This park is about dictatorship. And at the same time, because it can be talked about, described, built, this park is about democracy. After all, only democracy is able to give the opportunity to let us think freely about dictatorship.” To put this in my own words, I believe Eleőd decided to create this park as a testament to how far Hungarians have come, but also a reminder of where they once were. The existence of the park itself shows that Hungary has become a country that encourages free thinking and allows its citizens the freedom to critique the past in order to make room for a brighter future. He designed the park in a way that simultaneously represents the dictatorship that once reigned and the democracy that has now taken over. In this way, the park encapsulates the past and present of Hungary’s government. One aspect of Memento Park that stood out to me was how well the museum spoke for itself without the need for tour guides or plaques with extensive explanations. 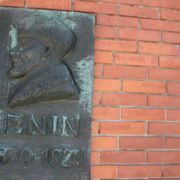 The prominent statues of such easily recognizable figures in history, such as Stalin or Lenin, needed no explanation. Anyone with a basic understanding of European history can tell what era these statues came from and the complicated history they represent. Their existence tells the story all on their own. This feeling of immediate understanding of the severity and depth of what I was looking at served as a harsh comparison to the House of Terror. Completed in 2002, House of Terror is a museum created within the building that once served as the headquarters and prison for the Arrow Cross. 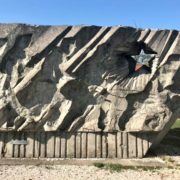 It is meant to both commemorate the victims of the totalitarian regime in Hungary and give visitors an understanding of what Hungarians experienced during this era. Hearing the name “House of Terror” and learning that we would be entering the building where hundreds of Hungarians were tortured and killed, I prepared myself for a grave experience that would stick in my mind for a long time to come. 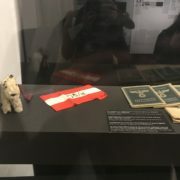 While the House of Terror was a meaningful experience that taught me a lot about the Arrow Cross in Hungary, it didn’t have the effect on me that I thought it would. My first issue with the set up of the museum was the overbearing amount of symbolism they attempted to stuff into every corner. Instead of letting the building and its history speak for itself, they tried to bring every aspect to a deeper metaphorical meaning that took away from my experience. If we had entered the museum on our own without a tour guide, like many people around us had done, I don’t think I would have been able to understand much of what I was seeing. For example, one part of the tour through the House of Terror is a maze where the walls are covered in bricks of lard. Because we had to keep moving through the tight hallways to avoid blocking the way for others to get through, I was separated from the tour guide and found myself entirely unsure of what I was seeing and what it was all supposed to mean. I eventually found out that the bricks of lard are meant to serve as a reminder of the peasantry being forced to hand over a certain amount of their supply, but this was not something I was able to determine on my own based on what was in front of me. On top of that, I felt that it added a juvenile aspect to what we were supposed to be experiencing. The walls felt playful and almost excessive, which is an extremely different feeling than I should have been having. This was just one example of many where the feelings connected to my museum experience did not match up with what I expected when we began the tour. This, in turn, took away from my experience because the overuse of symbolism changed the way I perceived what I was seeing. 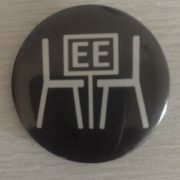 By overdoing the artistic and metaphorical aspects of the museum, its designers caused a disconnect between the visitor’s experience and the severe reality of the historical situation to which the exhibit was referring. 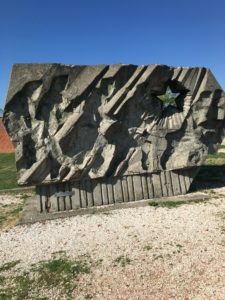 While I understand the importance of using these memorials to improve our understanding and appreciation for what occurred during the past and how it all shaped the world we live in today, I have also learned to consider the effectiveness of these memorials. While discussing our reactions to the House of Terror, I discovered that I agreed with many of the negative opinions other students had about the museum. This had me thinking further about why I had not noticed these things on my own, which lead me to the realization that I can appreciate the history being memorialized in a museum while also critiquing the way it tells the story. 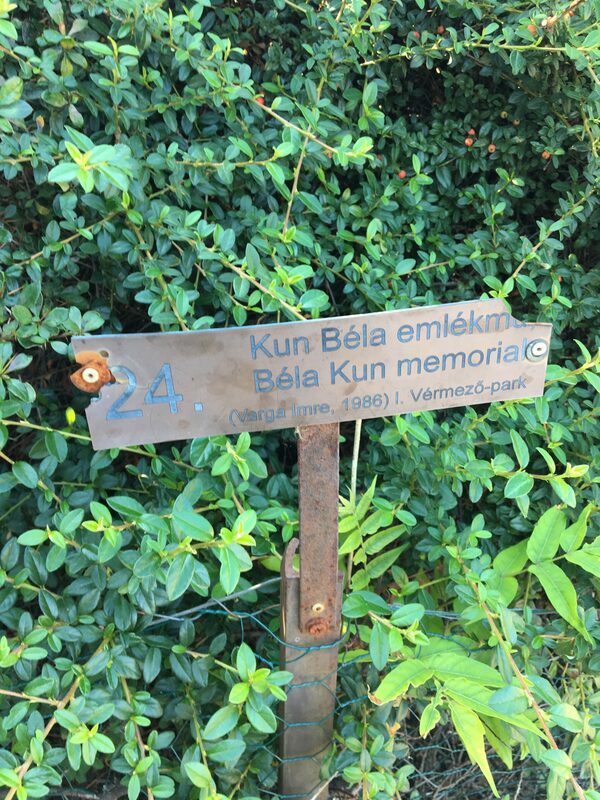 After visiting Memento Park, I was able to appreciate how, unlike the House of Terror, this museum let the history speak for itself. 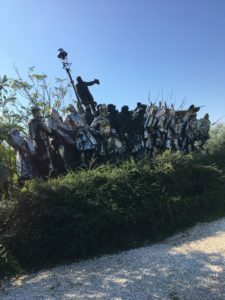 The imposing statues that made up Memento Park didn’t require me to unwrap layers of symbolism before gaining any understanding. I was able to stand in silence and appreciate the artifacts for what they were and the history they represent. While these are the opinions I formed about these two museums, I understand that other visitors may have had different reactions. The main thing I learned from these visits is the importance of being critical of my experiences. Paying closer attention to my own reactions to these museums and how effective they were in getting the information across has provided me with a more meaningful experience overall.